30 minutes easy chicken curry – A much loved recipe of chicken curry that is extremely simple, quick and cooked with basic ingredients available at home. A tender chunky chicken in gravy is absolutely delicious to go perfect with steamed rice or rotis or parathas. Here is how to make chicken curry recipe in an Instant Pot or on Stovetop step by step. 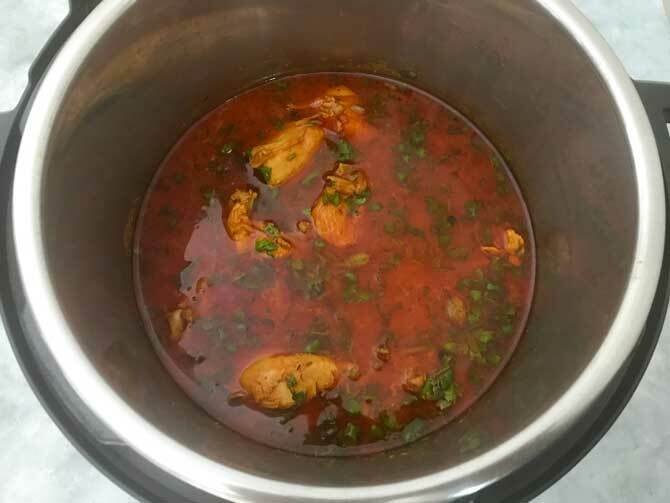 I have been receiving several request to post the recipe of chicken curry without coconut milk that even bachelors or a novice cook can make. The method do not require any special masalas or spices, not even readymade chicken curry masala powder. 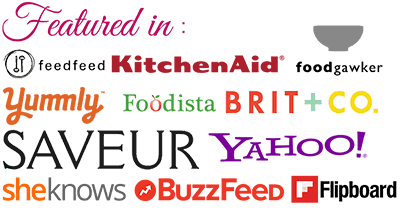 The basic ingredients that are available in your pantry is all what this recipe needs. I can definitely claim that this is the most easiest curry recipe you will ever make, a real no fuss chicken gravy. This is one dish that I can make even with my eyes closed. There are various kind of curries, but this one is its own kind and almost every week it’s on our table. Chicken Curry Rice is our favourite combo. 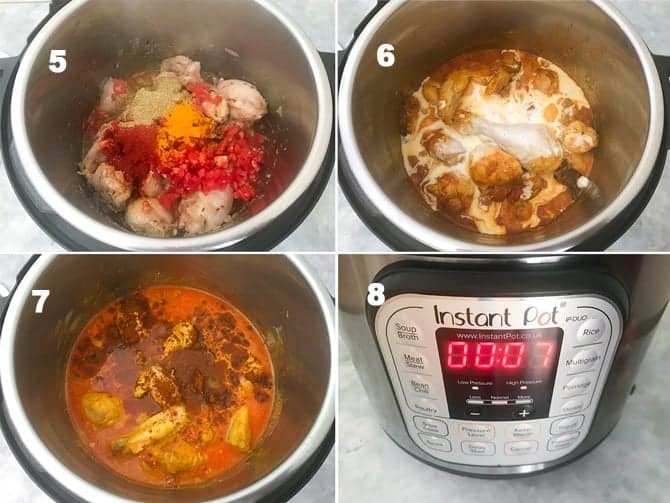 Below, I have demonstrated the instructions with step by step picture to make the chicken curry on stove top and Instant pot both. So without wasting much let’s go in detail of the recipe with tips and procedure. Tomatoes – even tomatoes can go-in chopped or ground to paste. 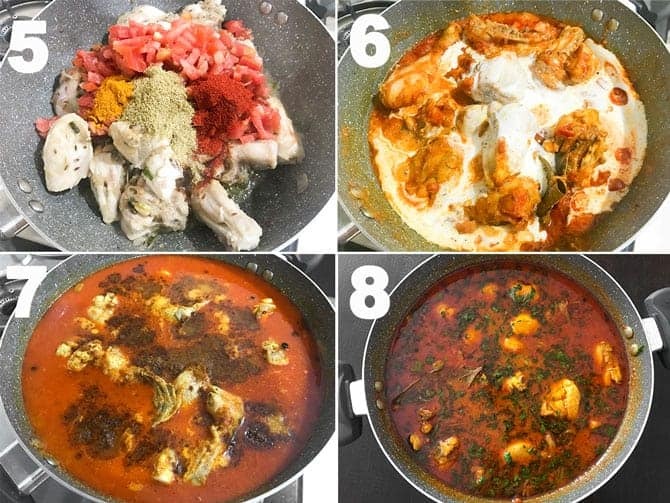 What to serve with Chicken Curry? The best ever combo, I myself prefer it with steamed rice, ghee rice or jeera rice. But, this easy chicken curry couples up with any Indian flatbread. Namely, Roti/chapati, paratha and even naan. Also, serve some fresh cut salad and onions on the side. 1. Switch on the IP, place the inner pot and press Sauté mode. Once the IP displays ‘Hot’, add oil in the pot and heat for 30 secs. Then add all the wholes spices and fry for 30 seconds until fragrant. 2. Now, add ginger paste, garlic paste, and chopped green chilies, fry for a minute or until fragrant. Be careful, stir to avoid it sticking at the bottom of the pot. In this case, you can add 2 tbsp of water and deglaze it. 3. sliced onions along with some last and fry for 3-4 minutes or until soft and pink. 4. Now, add chicken pieces and sauté for 2 minutes. 5. Add chopped tomatoes, red chilli powder, turmeric powder and coriander powder, sauté for another 3-4 minutes, stir in between. Add little water and deglaze the pot if anything gets stuck at the bottom. 6. Then, add whisked yogurt and mix well, cook for 1 minute. 7. Add 1/2 cup of water, garam masala powder and mix. 8. Now, Put the lid of the IP with pressure valve in sealing position. Press Manual/Pressure cook mode on high for 7 minutes. 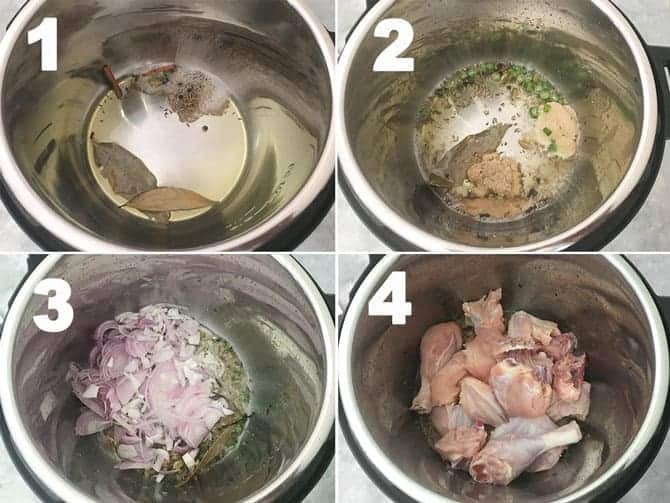 Once the pressure cooking is done, allow the pressure to release naturally for 5 minutes and then manually quick release the pressure by turning the valve from sealing to venting position. Allow the curry to rest for minute or two. Then add lemon juice, coriander leaves and mix. Instant Pot chicken curry is ready to serve. 2. Add garlic paste, ginger paste, green chilies and fry for another 30 seconds or until raw smell goes off. 3. Then, add sliced onions, salt and fry until it soft and pink. 6. Add whisked yogurt and mix. 7. Finally, add water, garam masala powder and mix. Bring it to a boil. 8. Cover and cook for 15 minutes or until, chicken is tender. Add lemon juice and coriander leaves, mix. Chicken Curry is Serve. Have you tried this “Easy Chicken Curry Recipe“? Please feed us with your ★ star ratings and comments below. 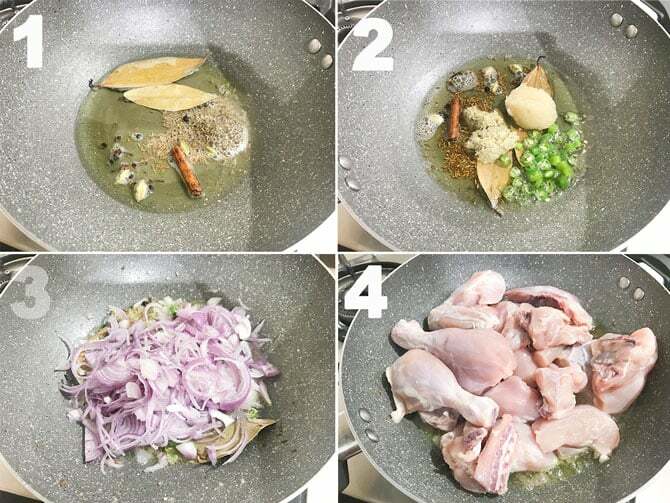 30 minutes easy chicken curry - A much loved recipe of chicken that is extremely simple, quick and cooked with basic ingredients available at home. 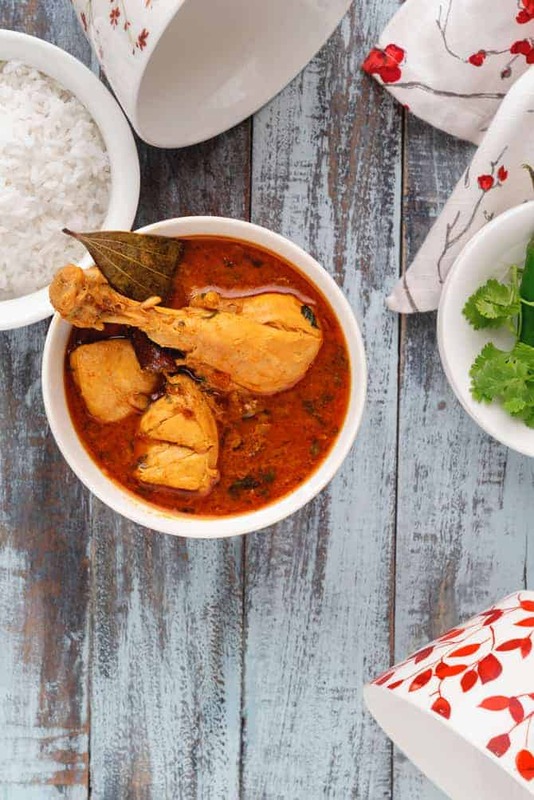 A tender chunky chicken gravy go perfect with steamed rice, rotis or parathas. 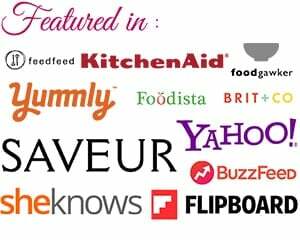 Step by Step Instructions for stovetop and Instant Pot. Switch on the IP, place the inner pot and press Sauté mode. Once the IP displays 'Hot', add oil in the pot and heat for 30 secs. Then add all the wholes spices and fry for 30 seconds until fragrant. Now, add ginger paste, garlic paste, and chopped green chilies, fry for a minute or until fragrant. Be careful, stir to avoid it sticking at the bottom of the pot. In this case, you can add 2 tbsp of water and deglaze it. Add sliced onions along with some last and fry for 3-4 minutes or until soft and pink. Now, add chicken pieces and sauté for 2 minutes. Add chopped tomatoes, red chilli powder, turmeric powder and coriander powder, sauté for another 3-4 minutes, stir in between. Add little water and deglaze the pot if anything gets stuck at the bottom. Then, add whisked yogurt and mix well, cook for 1 minute. Add 1/2 cup of water, garam masala powder and mix. Now, Put the lid of the IP with pressure valve in sealing position. Press Manual/Pressure cook mode on high for 7 minutes. Add garlic paste, ginger paste, green chilies and fry for another 30 seconds or until raw smell goes off. Then, add sliced onions, salt and fry until it soft and pink. Add whisked yogurt and mix. Finally, add water, garam masala powder and mix. Bring it to a boil. Cover and cook for 15 minutes or until, chicken is tender. Add lemon juice and coriander leaves, mix. Chicken Curry is Serve. Tried this recipe today. It turned out good even though I didn’t have yoghurt and was too lazy to get some😉.it still tasted good. It’s a quick and easy recipe. Hope u share such more quick and easy recipes in ur future post.